Theatre company Fish & Game have put together an affectionate (well most of the time anyway) take on classic Scottish novel "Sunset Song" (okay, I've never read it but Wiki was my friend). While the play's moments of absurdity won't be to everyone's taste, and you probably need to be in the right mood to appreciate it, as time went on I found any initial frustrations evaporating and I left with a smile on my face. I'm keeping this pretty brief as I think much of the fun would be spoiled by knowing the details in advance. It feels very much like a show from the Edinburgh Fringe with a simple set and a playful approach to theatricality. At times it feels a little self-indulgent in the first half and some of the set pieces are stretched too far, but the pay-off as the 'performance' deteriorates makes up for any flaws. Helped by a strong cast the play successfully asks some pointed questions - both about how we live now and how we view the past. With an extensive tour including some high profile venues "Otter Pie" is perhaps punching above its weight for a show that still feels a little thrown together. But for me that's the most exciting thing about the evening - finding a young company with the ambition, drive and ability to make it all happen. And tonight their efforts were rewarded with a Tramway venue filled with a very diverse audience - including a crowd of young theatregoers sitting near me who were genuinely enthusiastic about what they had just seen. 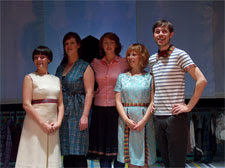 Otter Pie runs at the Tramway until Saturday 6th December and has sold out all performances.